The governor of Indiana signed a "religious freedom" bill Thursday that critics say legalizes discrimination against gays, lesbians and others -- and immediately encountered a wave of opposition from companies and organizations that do business in the state. Marc Benioff, CEO of San Francisco-based Salesforce.com, announced on Twitter that the enterprise software firm would cancel programs requiring customers or employees to travel to Indiana. 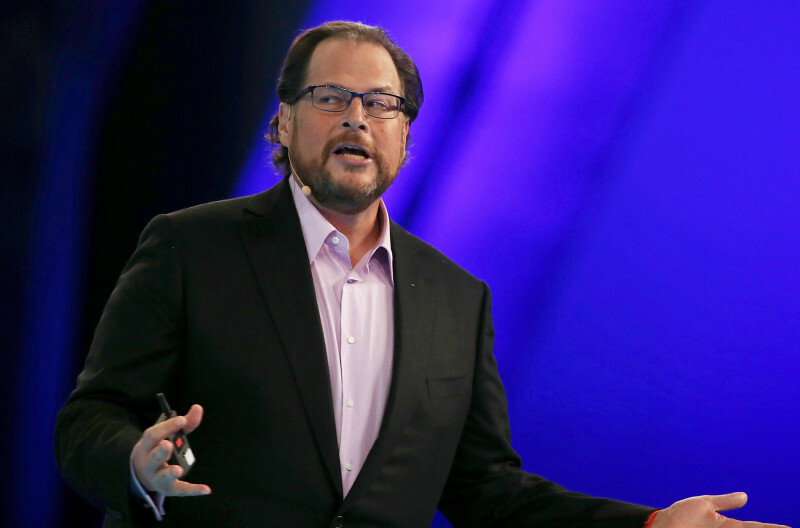 It's not clear how much of a dollar hit Salesforce's move represents. But the company's announcement was just one of several denouncing the Indiana law or raising questions about its impact on visitors to the state. Among those who had urged Gov. Mike Pence to veto the bill were leaders of Indiana's technology businesses. San Francisco Mayor Ed Lee also issued a statement condemning the new law and curtailing publicly funded travel by city employees to Indiana. The measure, signed in a private ceremony by Pence, bars state and local governments from actions that "substantially burden a person's right to the exercise of religion." The exception: laws or regulations that agencies can demonstrate serve a compelling government interest. The law also allows residents to sue to win exemptions from government actions they say violate their relgious freedom. The Associated Press quotes Pence as saying, "There has been a lot of misunderstanding about this bill. This bill is not about discrimination, and if I thought it legalized discrimination in any way I would've vetoed it." Liberal and civil liberties groups, including the American Civil Liberties Union and national and state LGBT rights groups, were uniformly critical of Pence and the new law. Conservative groups in the state, including Indiana Right to Life and the American Family Association of Indiana, applauded the governor. Eric Miller, head of a group called Advance America, was quoted in the Indianapolis Star as saying the law is important "to help protect churches, Christian businesses and individuals from those who want to punish them because of their Biblical beliefs!" Is it going to help the business community? Shouldn't the legislators be passing bills that help the business community, not hurt us? My great-grandmother, Rebecca Shapiro, once said: The only bad customer is the one that doesn't come in. On a personal basis, these types of legislation, it's very difficult for somebody being Jewish. I think it helps foster anti-Semitism and a lack of tolerance.